They are designed for use in applications such as switched mode power supplies, DC to DC converters, motor control circuits, UPS and general purpose switching applications. 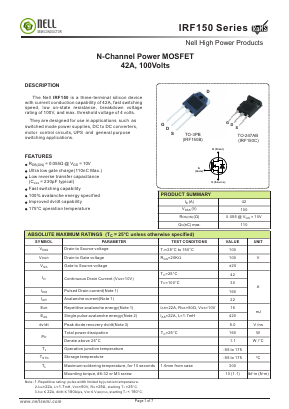 The Nell IRF150 is a three-terminal silicon device with current conduction capability of 42A, fast switching speed, low on-state resistance, breakdown voltage rating of 100V, and max. threshold voltage of 4 volts.